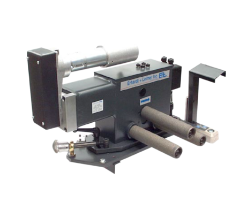 The EPILiner edge spreading system comprises two spreader units, each of which has a three-finger roller arrangement. The two fixed rollers are always in contact with the cord, and the movable roller dips in in the edge area of the cord. The width of the cord can be controlled by varying the roller immersion angle. Spreadability can be optimized by manually adjusting the correction angle. In particular, on calender lines ahead of the calender gap, or in hot-stretching lines ahead of the dip or ahead of the rewinding section, the use of an edge spreading system is essential in order to ensure uniform thread distribution. The EPILiner edge spreading system can be mounted in all positions. The infeed length should be at least half a web width, and the outfeed length should be kept as short as possible. Optimum web width control can only be achieved with the aid of a web guider arranged in the run-up.